When I think of summer, I’m always looking for the perfect clothing and accessories to make me feel cool and comfortable when the temps are blisteringly hot. Naturally, I want WOW! So, I look to nature for inspiration and beauty – whites and beiges, tropical colors and intense jewel tones – are always in my palate of summer-time fashions in accessories and attire, I want fun, contemporary and interesting. I’m the kinda girl that wants amazing design to help me make a statement that is totally me; never do I want to be a carbon copy of a magazine layout. 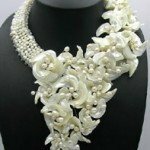 Make a statement this season in bold designs with big pearl, crystal beads, shell and mother of pearl designs that make you wanna holler… WOW!! !